My stay lasted 2 months (October-November 2010). A like… Apfelstrudel. Pure happiness! 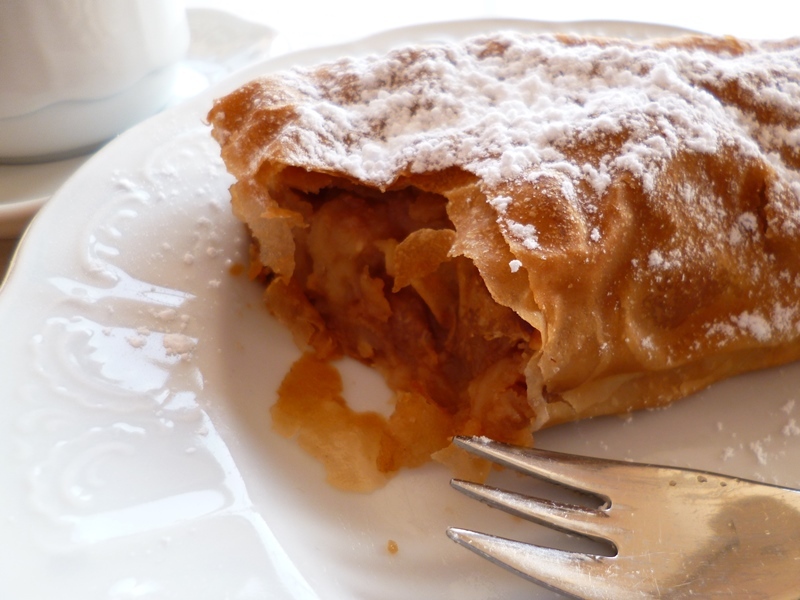 The cottage cheese version, Topfenstrudel, can be enjoyed in Vienna too. C like… Castles. 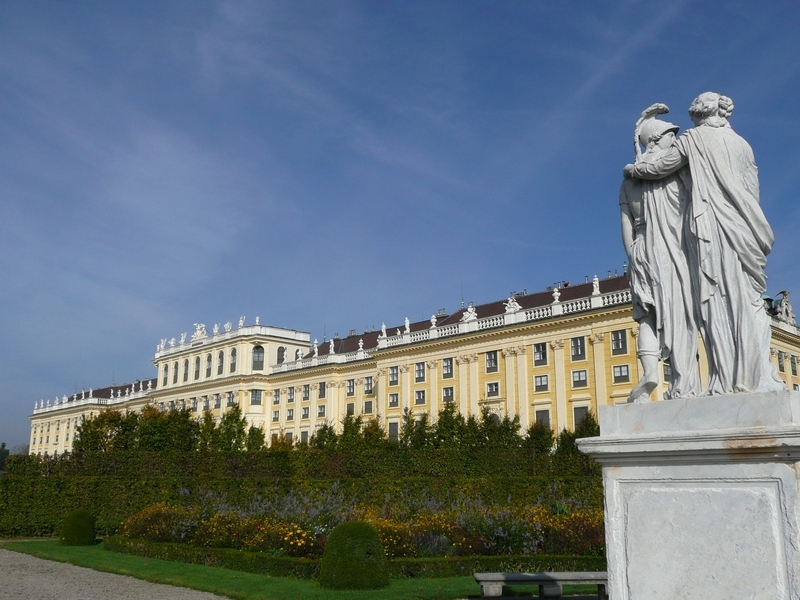 The two main castles of Vienna being Schönbrunn (see photo) and Belvedere. D like… Danube. The (not so) Blue Danube is crossing the city. E like… Euros. For 3 or 4 €, it is possible to enjoy a world class night at the opera in Staatsoper (see letter ‘O’) – these are standing places, but available at a hard-to-beat discounted price – well, OK, if it’s 4-5 hours of Verdi or Wagner, you’ll probably need a stretching session at the end of the show! And for 5 €, Wiener Symphoniker, Wiener Philharmoniker (the one of the famous New Year’s Concert) and other world famous orchestras will play for you in Musikverein (in the venue of the aforementioned New Year’s Concert, see letter ‘G’) – in that case too it’s standing places, but the length is much shorter than at the opera! F like… Friedensreich Hundertwasser Regentag Dunkelbunt LiebeFrau, aka Friedensreich Hundertwasser. An Austrian artist. Painter, architect, etc. – he left behind him many artworks, including a house. G like… Gesellschaft der Musikfreunde in Wien, aka Musikverein. See ‘E’. I like… Imperatrix Elisabetha Amalia Eugenia Austro-Hungarica ducissa in Bavaria et Principissa Bavarensis (in Latin), aka Sissi, one of the most famous resident of Hofburg. A museum about Sissi can be found in Hofburg. J like… Johann Strauss (Sohn), composer of the “Blue Danube”, one among his hundreds of waltzes. K like… Käsekrainer. Coming from Slovenia, this sausage is amongst the most popular in the Viennese sausage stands (Würstelstände, see ‘W’). Its particularity is to be filled with… cheese, melted cheese, as it is served grilled. L like… Lange Nacht der Museen (die -). A long night. Museums. All is said. M like… Melange, Wiener Melange. 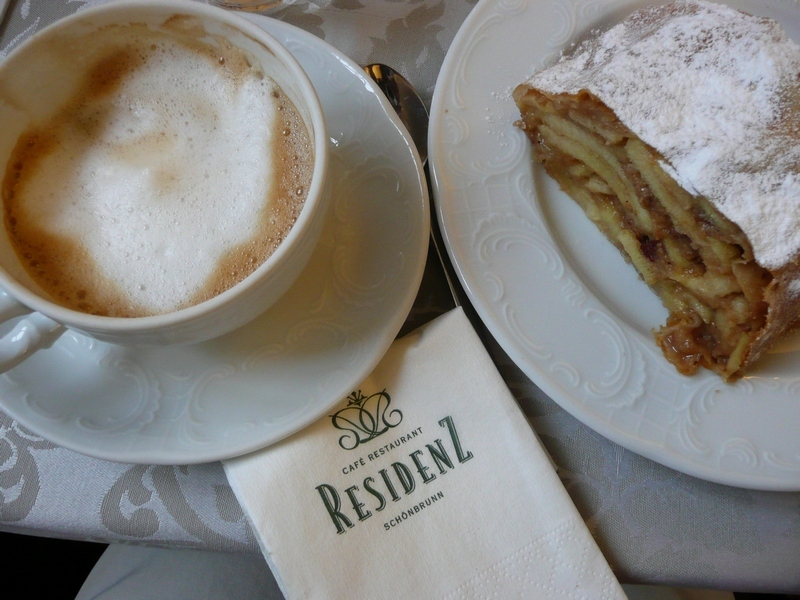 Viennese coffee speciality containing… coffee, plus milk and milk foam. A cousin of cappuccino. N like… Naschmarkt, the most popular market of Vienna, one mile long. O like… Operas. The two main opera venues of Vienna are Volksoper and Staatsoper (see ‘E’). P like… Philharmoniker (Wiener -). Wiener Philharmoniker is one of the highest rated of its kind on Earth. 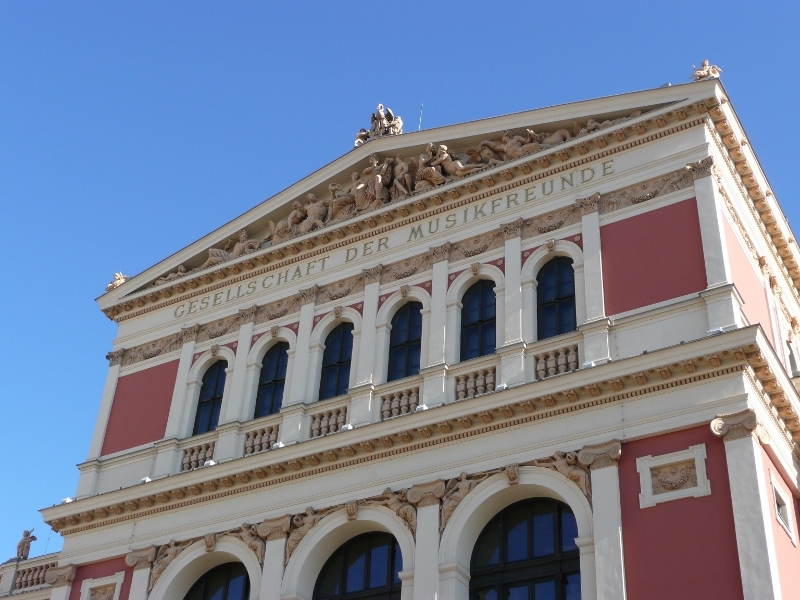 Performing regularly at Musikverein (see ‘G’). It can be as cheap as 5 € to listen to it (see ‘E’) or as high as 1090 € (New Year’s Concert). Even cheaper is its Sommernachtskonzert at castle Schönbrunn (see ‘C’ – not Sissi) as this is a free concert! Q like… Quartier, Museumsquartier (MQ). A quarter. Museums. All is said. R like… Resistance is useless. Nobody can resist to Viennoiseries. T like… Torte, Sacher Torte. Vielen Dank, Herr Sacher! U like… U5. There are five underground lines in Vienna: U1, U2, U3, U4 and… U6. Line U5 may appear in the future, or maybe not. V like… Viennese Waltzes. Many of them have been composed by the Strauss family (see ‘J’). W like… Würstelstand. A stand. Sausages. All is said. X like… X good reasons to (re)visit Vienna. Maybe even X+1. 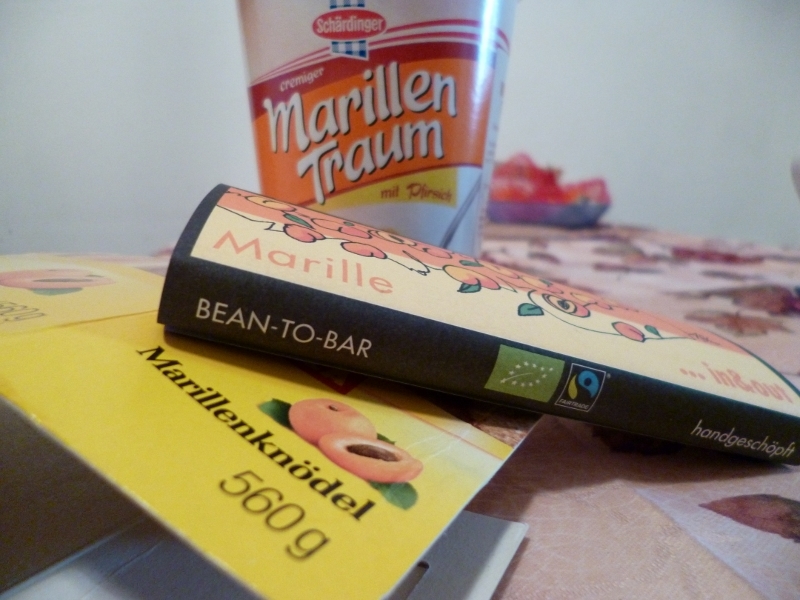 Y like… Yep, they have apricots too… they just don’t call them Aprikose, but Marille in Austria! Z like… Zwetschgenknödel and its brother Marillenknödel. Probably cousins of the quenelles (Lyonnaise cuisine), the Austrian Knödel, notably when stuffed with prunes and apricots, are indescribably delicious, if not deliciously indescribable! Do you have some tips for people planning a long stay in Vienna and its region?